Le chant des sirènes, [the siren’s call] (2015), loop sound-piece on digital media, 6’35 min. I archived the text of the brochures of land developers whose buildings border the future park of the Prairies Saint-Martin. I had them read by a speech synthesis system which sings the praises of real estate. 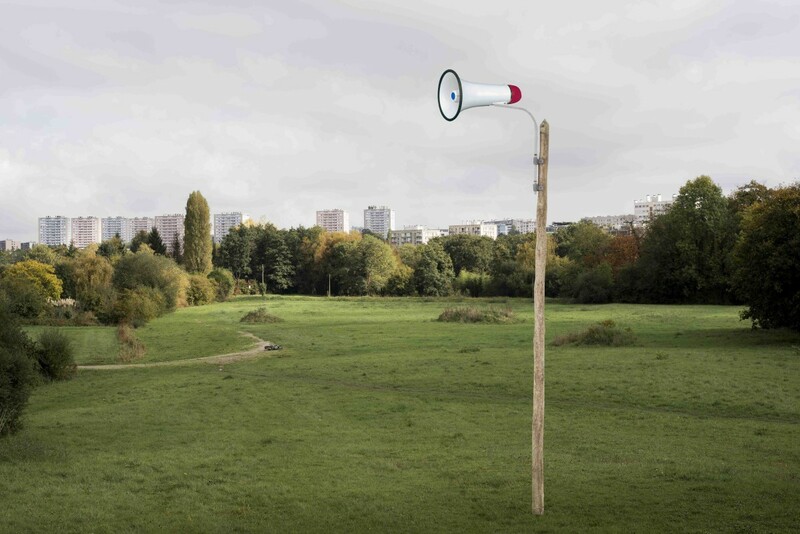 The sound-piece is designed to be played in the Prairies using a megaphone or outdoor loudspeakers. The installation evokes demonstrations and trade shows at the same time. In 2012, I began working in the Prairies Saint-Martin, a rapidly changing neighbourhood in Rennes, France, that will soon be changed into a public park. Beyond its local anchoring but also thanks to it, this project raises questions about the circumstances and the modalites of urban renewal. It also asks what it means to represent a place with fragments of it, be it with photography, video, sound, performance, etc. What is the role and what are the tools of a documentary project, and what are the circumstances and the temporality for its communication ?